This story, for me, begins on a fall day in 1998, the day that I helped Kendal Dodge Butler clean out her mini-storage in Walnut Creek, California. Earlier that year she had sold her house and re-located to San Miguel de Allende, Mexico. Now, she was back in the Bay Area to sort through the rest of her belongings and decide what to ship to Mexico, what to give to her daughter, and what to discard. I was more than happy to help her out. As a fan of her fathers writing, I was hopeful that we would discover some interesting things among the papers and files that her parents had left her after their deaths; as a librarian and archivist I thought that, if we did find papers, I would be in a position to advise her on the proper long-term housing and storage of the materials. I was right on both counts. Tucked away among the excess household goods were a couple of boxes of David Dodges files, correspondence, photograph albums, 8mm films, and, to my great delight, manuscripts. 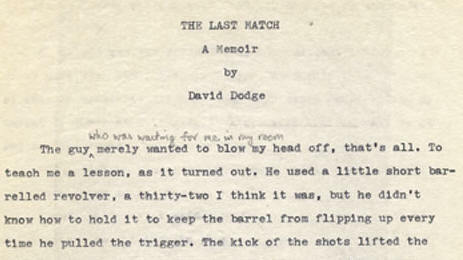 The manuscripts included a charming little story called The Loco Weed, that he wrote as a schoolboy, two unpublished short stories (Bermuda Triangle and A Matter of Considerable Interest), the incomplete fragment of a third story (Living Doll), and one complete novel, entitled The Last Match. I selfishly—I mean, generously—offered to keep the papers and try to organize them; Kendal graciously accepted the offer. Thats what I did. For the next several weeks, I spent my lunch hours in my office, transcribing the typescript on my PC. I have to admit, it really helped my typing skills. After I had it typed, thoroughly spell-checked, with font, margins, and line-spacing adjusted for easy reading, I printed out two copies. I sent one to Kendal and took the other one home to read in bed. After I read it, I wrote up a summary review and posted it on this site in the Novels section. Then I put it away, thinking that I would be one of only two people to ever read it. Fast forward to August 2002: I received an email from Charles Ardai, inquiring about the publishing rights to David Dodge material. He was starting up a new paperback publishing venture and was interested in bringing a Dodge title back into print. He was initially interested in Plunder of the Sun, but was also curious about The Last Match. I referred him to Kendal and figured I would probably never hear from him again (he was not the first person to contact me about publishing Dodge material; fortunately, he was much more serious about it than the others). Fast forward again to September 2003: Charles Ardai contacted me again. His new paperback line, Hard Case Crime, was going forward. He was still leaning towards Plunder of the Sun, but also still curious about The Last Match and wanted to see a copy of the manuscript. Fortunately, I had that electronic version just sitting on my hard drive. I emailed him the files. This time, I figured I would definitely hear from him again. In 2004, Ardai told me that although he had really liked The Last Match (much more than most final, posthumous novels Ive read), he had signed a contract to reprint Plunder of the Sun (the Hard Case Crime edition appeared in May 2005), and I again assumed that would be the last I would ever hear about The Last Match. Now the David Dodge canon is complete. The Last Match may not be his most polished work, but it has all of the characteristics that make his novels great: crisp, witty dialogue, memorable, sharply drawn characters, exotic locales, and tight plotting. It is definitely his most personal novel and it provides a very nice final chapter to his career. Im proud to say that I played a small part in getting it published. And the manuscript? Dont worry; Ive still got it.